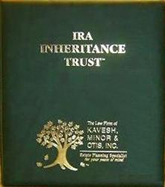 Estate planning attorney, Philip Kavesh, developed the IRA Inheritance Trust®, which became one of the biggest breakthroughs in estate planning in the past few years. This trust strategy, which effectively is described as a "Living Trust for an IRA"SM, is a standalone trust instrument for IRAs, 401(k)'s and other retirement assets. It was not only created to provide better estate planning options for retirement assets, but with the assistance of Keebler & Associates, LLP, was approved by the Internal Revenue Service in Private Letter Ruling 200537044 back in 2005. If you are an estate planning attorney and are looking for an easy, simple and reasonably-priced means of implementing this unique strategy into your practice, you can now do so for a low one-time licensing fee of just $2,195. Sample binder of the complete document assembled so you can see how Mr. Kavesh's law firm packages and delivers this unique trust to his clients. All of the legal document forms come in a modifiable Microsoft Word format for you to be able to easily modify, edit and assemble (or add to your existing word processing software). NOTE: This is NOT a software program and there are no automated/macro-type functions with our forms. While drafted for Mr. Kavesh's law firm based out of California, this strategy is based on federal law and has applicability to all states.